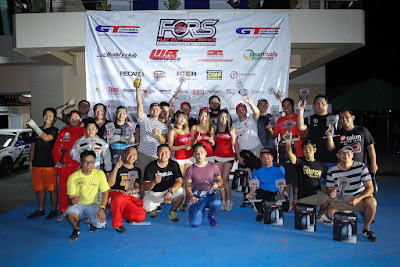 Over a hundred entries turned up at the Clark International Speedway last October 22 for the eight round of the GT Radial FlatOut Race Series (FORS). This served as the final battle ground for the Time Trial and Grid championships to cap off a successful 2016 season. “For racers, by racers” - the country's premier grassroots motorsports event welcomed several new changes at the start of the year. 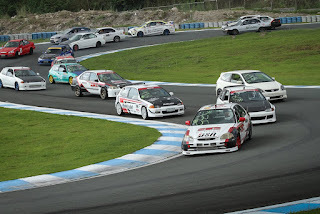 The Automobile Association Philippines (AAP) were brought in as observes to guide both the racers and organizers, stepping up their skill to proper local and international standards. Also in collaboration with the AAP, graduates of the Motorsport Development Program (MSDP) got their first track experience running in FORS. Finally, Grids A, B, and C drivers were all required to apply for a Clubman license while Grid E was added to accommodate the growing number of competitors. JC Baguisa made an impressive comeback to the series by setting the fastest time in Bracket A. He managed a 2:11.763 lap in the Blanche Racing Honda Civic to take 1st place. Rafael La'O was 2nd with a 2:12.953 lap followed by Ferdie Sia in 3rd who clocked a 2:16.050 best. Despite retiring from this event, Eduardo Suiza still walked away with the title with his consistent results. Sydney Sarmiento claimed back-to-back victories in Bracket B. His best lap of 2:17.411 was almost 2 seconds quicker than Jun Cabrera who ended up in 2nd and Dominque Bon in 3rd. Raffy Sohu in the PAGCOR/Zenium/Gerco-sponsored Honda Civic was delighted to win his first race of the season in Bracket C. In 2nd was his older brother Gabby who was bumped down from Bracket B during the race. Still, Gabby managed to collect enough points throughout the season to be Bracket B champion. Joey Howard was 3rd while Paolo Lofamia who ended up 4th fastest took home the Bracket C title. Another Sohu brother stood on the top spot of the podium. This time it was Miggy in Bracket D who outpaced both Alex Perez in 2nd and Polo Bautista in 3rd. Sherwin Bargos who was 5th fastest that day earned enough points to seal the Bracket D championship in his name. Bracket E saw Jack Saquilayan finish 1st followed by Andrew Martin and Mon Rimando in 2nd and 3rd, respectively. Robert Tan found himself a class higher in Bracket F, but was still able to seal a win beating the newly crowned class champion AR Lanting who ended up in 3rd. Robert also bagged the Bracket G title even if he didn't race there this round. This allowed Mark Pascual in the BYD F0 micro car to earn his first race victory. Marc Macas was 2nd while Karol Collantes finished 3rd. The day's fastest time of 1:59.455 was set by Vincent Floriendo in a Ferrari 458 Challenge who also won the Bracket R class. Finally, Robert Tan was the fastest driver Grupo Toyota while Mark Bernardo took the win in The Perfect Lap. 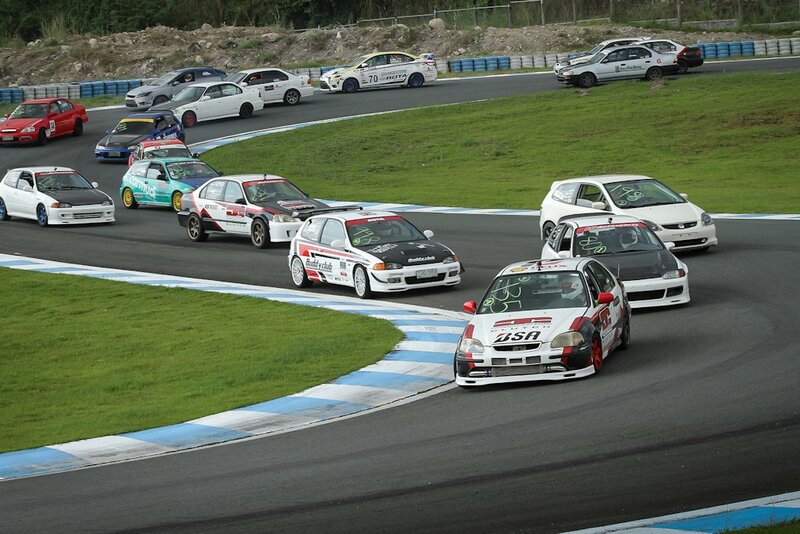 Rafael La'O, JC Baguisa, and Ferdie Sia were inseparable throughout the 10-lap GT Radial Grid A race. Starting from pole, Baguisa opened an early lead until he suffered mechanical problems with only a few laps to go. This allowed La'O to get ahead and cross the line in 1st. Baguisa would salvage 2nd while Sia ended 3rd. The big winner though was Eduardo Suiza who bagged the Grid A title even if he missed the race. Sydney Sarmiento fought hard to keep Jun Cabrera behind him in the Smart Fuels Grid B race. In the end, his efforts paid off and finished 0.622 secs ahead of Cabrera to take 1st. But the class championship went to Gabby Sohu who found himself down in Grid C in the season finale. It was a 7-car train in the Competition Clutch Grid C race. Joey Howard made his Blanche Racing Honda Civic as wide as he possibly could to stay in the lead. He managed to stay ahead to finish in 1st and take the class title in the process. In 2nd was his teammate Aaron Lao while Gabby Sohu was 3rd. MSDP graduate Polo Bautista drove brilliantly to win the 8-lap Buddy Club Grid D race. Following behind was Sherwin Bargos in 2nd who sealed the class championship with his podium finish. In 3rd was Michael Suiza. Finally, Anthony Richard Lanting proved why he's the Works Bell Grid E champion by finishing 1st ahead of Leo Candava in 2nd and Andre Makkina Tan in 3rd. 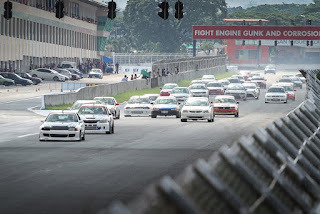 With the 2016 GT Radial FlatOut Race Series now in the books, the focus now turns to the 8 Hour Philippine Endurance Challenge (PEC) on December 3-4 at the Clark International Speedway.